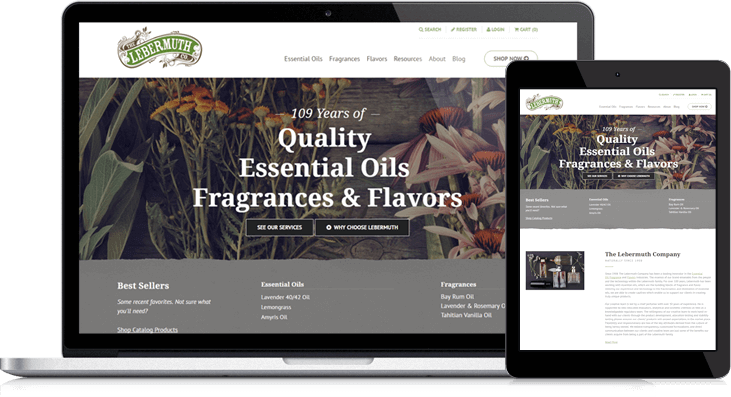 With an impressive history that dates back 109 years, Lebermuth sells wholesale fragrances, flavors and essential oils to companies who develop perfumes, food items and other products. The company started when the founder realized he could earn more trading peppermint oil than he could trading farm produce. Lebermuth was proud of its longstanding history, but it felt a bit differently about its longstanding website. The company was yearning for a modern website design that met two main objectives. The site needed to be easily edited by the team. And it had to provide a great user experience. LyntonWeb initially did the integration work for Lebermuth, so we were at the ready when they asked if we knew of a company that could do HubSpot website redesigns. LyntonWeb and Lebermuth had a great rapport establishing what pieces of functionality would need to be set up to meet Lebermuth’s business needs. Numerous customizations were required and provided. Some of them were small yet crucial, like a searchable database of certifications and documents the company was legally obligated to maintain. Others were larger and just as crucial, such as the ability for Lebermuth team members to edit content pieces without the assistance of a developer or external agency. To achieve the desired goals and functionalities, the website first had to be moved from its existing platform, a proprietary system known as American Eagle. The new website was built on HubSpot and Shopify, with HubSpot providing efficient content and customer relationship management and Shopify providing an e-commerce store. The end result is a modern, streamlined site that provides an exceptional experience for users as well as the Lebermuth team. Team members can manage content on their own. Site visitors are treated to valuable information and easy navigation, quickly able to see both how and why to choose Lebermuth products.